2017’s Word of the Year Is. . . If I could use one word that I would like to describe 2017, it would actually be two words – Bucket List. After my sister’s death four months ago, my pastor had sermons about Bucket Lists. As I listened to Pastor H., I knew God was speaking to me directly especially when I had tears rolling down my face. I will never know if my sister had a bucket list which is one of my struggles through my grieving process. There are times are when I feel guilty when I cross items off my list since she had never got to cross items off her list. On Thanksgiving I sat in the tub crying because I felt guilt because I was going to eat dinner at the Animal Kingdom’s Boma Restaurant. Something that could be crossed off my bucket list. That afternoon we had to go to Animal Kingdom before heading over to the Lodge. I was photographing Animal Kingdom’s Christmas tree when I noticed a monarch butterfly. Before I could get a photo of the butterfly, it had flown off. Later as we were on the overlook at the Animal Kingdom Lodge, another monarch butterfly or the same on flew by again as I was observing one of my favorite animals, the giraffe. 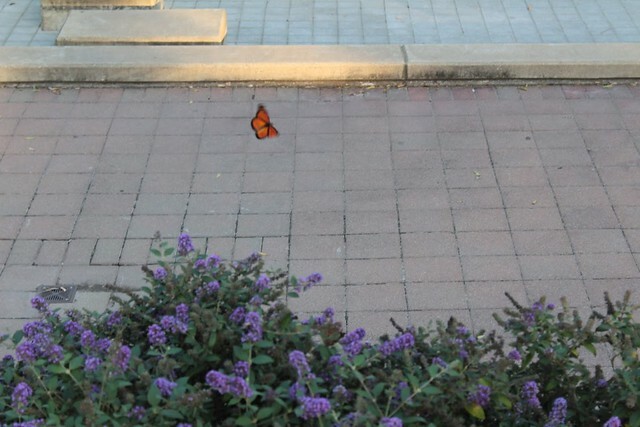 I forgot to mention that ever since my sister died in August that I had seen a monarch butterfly several times – at her old apartment, at her funeral, when I was visiting with family, and at work during dismissal duty. I also saw a lot of monarchs when Hubby and I traveled to Louisville, Kentucky to cross off another item on my bucket list. Louisville, Kentucky – Over purple flowers – Her favorite color was purple. Even though I will still feel some guilt about crossing items off my bucket list, I know she will be with me along the way. During 2017, I’m going to continue crossing items off my list while adding new items to the list. So my word for the year is Bucket List. What word do you want to describe your 2017? That is so lovely. I love when our loved ones show up in unexpected ways. I do believe that these things happen for a purpose. I’m so sorry about the loss of your sister. It was unexpected while we were in Disney. I took her on many journeys over the years before she died. During the past few years, it’s been few and far between since I was raising my two boys. I’m glad she is going to be with me once again. I’ve got three trips planned so far for this year. I am so sorry for your loss, but I love the imagery of the multiple butterfly sightings as you heal in the wake of your grief. I too have known similar grief and while you will always miss your sister I promise that the wonderful memories you shared with her will make you smile on many occasions ahead. Keep making more memories and checking off that bucket list! My sister knew I love butterflies so I think that is why she has shown up as a butterfly. People have their way of making themselves known. The bucket list will help you cope. Making memories is important and that’s exactly what you will be doing. Can’t wait to hear about your adventures along the way. I’ll be sharing photos of our Thanksgiving trip starting tomorrow. Every Saturday I’ll be sharing more photos from different parts of the trip. I don’t have a word of the year, but I always enjoy reading other peoples choices. Wellness is a good one. Wow! What a beautiful moment to experience with that butterfly. 🙂 Special symbols like that remind me that you’re not alone and it’s okay to live your life. This post gives me chills. Your sister is all around you. I am so sorry for your loss, but so happy that you have this amazing presence in your life. Thanks for this today!